A couple of weeks ago we welcomed home our newest addition, Toby! He's our third little boy and I'm sure will be all too quickly tailing his big brothers around the house. Being a family with two cats, two dogs, a three-year-old boy, a two-year-old boy, and now a newborn definitely provides plenty of opportunities for my husband and I to practice our management skills! As a family that has experienced bringing home newborns a couple of times in the last few years, made it a little different for us in terms of preparing our dogs for this latest change. I now know that our dogs are fine with baby swings, baby chairs, diapers, music, white noise, crying infants, etc. Most of the things that we worried about preparing them for in the first (and even to some degree with the second pregnancy) were not really concerns for us this time. Some things, however don't change. 1. Furniture changes - even though Beskow and Kaylee have dealt with all of the infant furniture before, it was still a big change when we started bringing out the baby furniture and toys, so we made sure to do this well before the baby was due. Our crib, changing table, and everything else were old news once again by the time Toby made his appearance. 2. Sleeping arrangements - as noted in my last post, the dogs (and cats) typically sleep on our bed. With a newborn in the bedroom and us moving around at night, this was not an option anymore. In the last couple of weeks before Toby was due, we started crating the dogs at night again. This is something that they don't mind, but it was something they hadn't had to get used to since Felix was born two years ago. The first couple of nights Kaylee whined a bit and when we got up during the night Beskow would perk up and decide she should wake up, too - but after that they settled right into the new routine. This meant that by the time the baby came, they were used to going up to bed in the crates and, just in case the crates were something they considered less desirable, they were in no way associated with the arrival of the baby. 3. Refreshing training - there are some behaviors that I don't mind (my dogs jumping on me when I come home being one of them...) that aren't okay when we're carrying and caring for a newborn. So in the last two months of my pregnancy, we refocused on the jumping on me at the door. They're now past it (at least for now!) and I feel confident they will keep their feet on the floor when I'm coming in and out of the front door carrying or wearing a newborn. We also reviewed their drop its, leave its, go to bed, and "off" of the couch. Since they have had good training in the past, this was pretty straight forward but a few treats thrown at behaviors tends to make them stronger again! 4. Lastly, space management. Now, more than ever, we have to know where the dogs are all the time. Our older two are not old enough to be trusted alone with them and our youngest can't be left out of sight with them. Our house has gates at the top and bottom of the stairs, crates in our bedroom (which has a door the kids can't quite open yet), and cribs for the kids. There's a fair amount of coordination required, but we very much define our parenting of kids and dogs at this point by the Family Paws concept of Success Stations. When the older kids are home the dogs are frequently gated upstairs or downstairs away from them. This still leaves them lots of time with me during the day since I'm on maternity leave, and time with us in the evening after the kids are in bed, but during "flash points" in the day- breakfast, dinner, bedtime- we can keep everyone safe, happy, and in an environment that is as minimally stressful to them as possible. My priority at this point is in preserving everyone's relationships until my boys are old enough to truly engage successfully with the dogs. I love all five of them (and the two cats!) but at this point, so much of our life revolves around managing the dogs and kids successfully so that they can't accidentally hurt each other or make each others' lives more stressful. Introducing another new baby adds an extra challenge, but also reminds me of how truly awesome my dogs are and how happy I am that my kids will have their early learning experiences in canine companionship with these two pups! Start AFTER your puppy is house trained. An un-housetrained puppy should be contained in some way- a crate, an exercise pen, or a tether- at night to help them understand about “holding it”. Know that this is something you have control over. If your dog is snarling at you for approaching your own bed; snapping when you ask them to get down; or in some other way making you feel threatened, then STOP. They don’t have to sleep on your bed- it should be a nice thing for everyone involved, not just your dog. Work on an “off” cue, so you can ask them to get down when need be and there’s no need to use physical force to move them. Other than that, I pretty much leave it up to the owner. That being said, once you’ve allowed (ahem.. in my case, encouraged… ) your dog to sleep on your bed for five years, know that asking them to sleep elsewhere may take a little convincing. Wouldn’t it take some convincing for you to stop sleeping in your own bed? So what did I do? Not that these are rules, but maybe you’ll find them handy. I decided on the day and I stuck with the plan. The first night, Kaylee paced around the bed for about 15 minutes waiting to see if she would get invited up. My husband and I ignored her. Completely. No attention for whining, no apologizing, no giving in. Just like any other behavior change plan, consistency is king. I bought her a new bed… Yes, I’m a bit of a softie, but honestly, if I’m going to kick her out of “her” bed, then I better provide her with a good option. It just didn’t seem fair otherwise. She took the bait. After realizing there was no invite to our bed forthcoming, she headed over to her Snoozer Cozy Cave, crawled inside, and went to sleep. Remembering to kick her out at 2 am. The first night went great, she didn’t even try to get back into our bed. But the last couple of nights, she’s snuck back in around 2 am. Even though it would be easy to just let her stay, we’ve been working on staying consistent about kicking her back out as soon as we realize she’s there. Just because you decide to let your dog sleep in your bed, it doesn’t mean it’s forever. Decide what YOU want- what works best for your family, and go from there. For me, 90% of the time, it works to have my dogs in my bed, when it doesn’t we change it. You can do the same! So, I guess my answer to Should I Let My Dogs Sleep In My Bed? is... Why not? Many of the dogs we know and love are, well, a little nutty. One of my own dogs is a four-year-old Border Collie mix with anxiety issues. Although she is fantastic with my kids, things that are out of the ordinary tend to spook her. Just the other day, we were out for a walk when a man came walking in the other direction with a young child riding piggyback. While my dog is quite accustomed to walking past people on the sidewalk, she was clearly excited by this odd two-headed person that had just entered her world; she sniffed and pulled a bit toward them. The fact that she didn’t also bark is the result of lots and lots of training to help her learn that new things mean treats, which helps keep her focused on me when she gets stressed. However, most dogs do not get that level of training and are frequently surprised or scared by new things in their environments. Have you ever seen a dog bark at a person in a wheelchair? On crutches? With a walker? On a skateboard? All of these things are outside their realm of normal experiences and can scare them. Most dogs will either pull in for a sniff or shy away. Unfortunately, some dogs will instead react aggressively, in an attempt to make the “new scary thing” go away. It is not hard to imagine that a person walking toward your dog with a second head staring out from their chest would fall into this “weird and spooky” category. 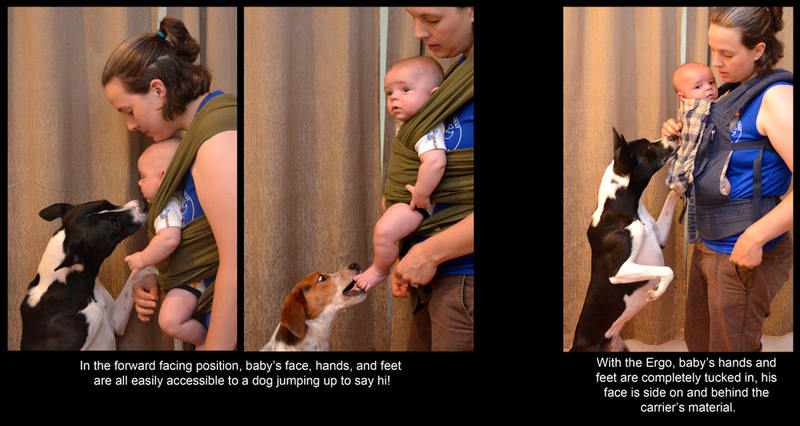 Babies in front-facing carriers have a lot of potential to frighten dogs, which is clearly something we want to avoid. Surprised dogs, even dogs that are otherwise well behaved, can be unpredictable. Because my goal is to help you keep you, your baby, and your dogs happy, safe, and comfortable, I recommend the Ergo to my clients in order to prevent this possible bite risk. I encourage expectant parents toward the Ergo for two very important reasons. First, the baby’s face is against the adult's chest; and second, the baby’s feet and hands are tucked up inside the carrier. This is also true of wrap-type baby carriers, when the baby is placed in a chest-facing position. However, those types of carriers are often difficult to have in a house with pets, because they attract fur when they touch the floor as you’re putting them on. The majority of dog bites to children are to the neck and face. It is of primary importance to keep your baby or toddler’s face protected from dogs you are unfamiliar with. Babies tend to stare. They have big, round eyes that fixate on new objects and study them intently. Prolonged eye contact makes many dogs extremely uncomfortable. So, the number one reason I prefer the Ergo is that it keeps my infant’s face turned toward my chest. This serves the dual purpose of eliminating the long “baby stare” and keeping his face safe, if a dog does happen to jump up (whether maliciously or not). This is, to a lesser extent, also true with an older child. Although my 18-month-old can twist around to see what I’m looking at and say hi to a dog, he is not constantly staring out and presenting his entire face to the dog. After the face and neck, the primary bite targets are the extremities- hands and feet. In the population at large (not just infants), 71% of bites are to the extremities. Do you really want your baby’s feet hanging at nose level when there are strange dogs about? I know I certainly don’t want that for my children! When the Ergo is used for an infant, their legs and arms are completely tucked inside, with nothing dangling down. While the majority of dogs you meet are not a bite risk to your baby, there are enough dogs out there that are not properly socialized to infants, that are a little uncomfortable with staring faces, or that react aggressively when surprised, to make it worth choosing a carrier that will keep your baby as safe as possible. For me, the choice is the Ergo. I encourage my clients with dogs to choose it as well, because it is one way to eliminate possible harm to your child- and really, it’s much kinder to the dogs as well, because it eliminates one potential source of stress and discomfort for them! Long before Oliver (my 19-month-old son) was born, I began planning how to make my dogs happy, comfortable, and safe to have around my toddler. However, as I worked on that, I also came to realize that it was not enough. There are many, many dogs in the world, and I wanted my son to be as safe as possible around ALL of them. While avoiding them might be an option for some people, I’m a dog trainer- many of my friends have dogs, and all of my clients have dogs, People in general expect me to like their dogs and want to say hello (and I do want to- just not necessarily with my baby in tow!). So, how could I make sure my son was safe around dogs that had not been prepared to deal with a running, yelling, exuberant toddler? This question led me to Madeline Gabriel’s blog: www.dogsandbabieslearning.com. She has a fantastic series of articles about not “magnetizing” your baby to dogs (here). Think about a compass that always points north… a magnetized baby can usually be found hurtling towards any dog they see, while screaming “doggy” and charging in for a pet and/or hug. I’m not going to rewrite what is a truly fantastic series- but I do encourage ANYONE with kids or expecting a baby to read all of the parts of this series. In these articles, she basically shows the reader how to teach their baby to be safe around dogs, the same way you would teach them not to touch knives. Just as you would never leave a baby alone with a knife, you should never leave them alone with a dog- but in both situations, you canteach your baby to be behave in a pretty reliable and safe manner. Since Oliver was very small, we have spent a lot of time using the language that Madeline Gabriel encourages in her blog, i.e. “Yes, that’s our dog, Kaylee. Kaylee is a good dog,” or “Dogs like a little more space. Let’s move over here so she feels safe. Look, our dog is staying with us! You helped her feel safe. You are a good friend to dogs!” I’ve also added phrases like “We only touch the dog with our hands!” and “Beskow’s sleeping right now, let’s leave her alone to rest,” and other (often self-evident) phrases. The importance of this dialogue is three-fold: it makes your child engage with you rather than with the dog; it reminds you what is appropriate behavior around the dog and encourages you to always be paying attention; and, as your child grows, they start to understand what you’re saying, it sounds familiar, and they’re used to listening to those phrases. In our family, the result has been a child that likes the dogs, likes to share his food with them (sigh), but leaves them alone when they’re on the couch, in their beds, or eating their dinner. He often plays next to them on the floor without so much as looking at them. Is he 100% reliable? No! He’s still a toddler, but most of the time, he leaves them alone or interacts appropriately. This morning, when he came over and started driving his car along Kaylee’s back, because we already had the rule “we only use hands on the dog,” he cheerfully relinquished his car, gave her a nice pet on her shoulder, asked for his car back, and went to back to his play on a more appropriate surface. When we’re out of the house, now that Oliver is walking, I pick him up when we approach dogs, he waves hello, and we go on our merry way. As far as I can tell, he has never considered running up to a dog to say hi- it’s not in his behavioral repertoire.This weekend, however, was our first real test. We went over to a friend’s house to play. They have a toddler, so I was pretty sure their two dogs - a Doberman Pinscher and a small Rat Terrier mix - were safe for my two babies. When we got to the house, the Doberman was crated to avoid an overenthusiastic greeting (hurray for dog owners who know their dog! ), and the little dog came running over to give Oliver’s hands a thorough licking. He looked down at the dog, smiled … and then went over to play with the other little boy! WOW! I was FLOORED! He’d never been in a situation with a small, excited dog to play with- and he acted completely unmagnetized. I was incredibly excited. The second test came about 45 minutes later, when they let their Dobie out of his crate. Now, our dogs are medium-sized, but Dobies are big. I was sitting on the floor and his head was well over eye level. As far as I can remember, Oliver has never been around a dog that big. Dexter the Dobie came out happy to say hi- licked Oliver’s face a couple times and began making the rounds. And … Oliver just kept playing! I cannot even begin to tell you how excited I was about this. If anyone out there doubts the power of Madeline Gabriel’s advice, I challenge you to raise your child this way and see how he or she handles these situations. I could not have been more thrilled. Even if either of those dogs had been a little nervous around little kids, they would not have had to deal with any staring, chasing, or grabbing- Oliver would have given them a safe, appropriate amount of space. My child, I believe, can be declared unmagnetized to dogs! One thing that is very hard to predict is when your baby is actually going to decide to make his or her grand appearance. With my first son, we had zero warning: we were out, my water broke, and all we had time to do was stop by the house to pick up the suitcase and head straight to the hospital. With our second one, we had a little more warning, but since he was a week and a half late, it was definitely not on a day we could predict. So, what will you do with your dog when your baby decides the time has come? That is up to you, but I encourage you to sort it out well ahead of time. Is there a neighbor, family member, or dog walker who can be available at the drop of a hat? Do they already have your key? If your dog hasn’t ever been left alone overnight, is your helper available to stay over or take the dog to their house without too much warning? You should have a very definite plan in mind, and make sure you have a couple of people designated as backups to at least let your dog out to pee or feed them – just in case your first person loses their phone or something (for example, our dog walker was unexpectedly out of state for a funeral when our first son arrived). When you first arrive home with the baby, leave them outside with someone while you go in to greet your dog. Let your dog get over their excitement about seeing you. Let them smell the new smells and settle back down before bringing in the baby. I found it helpful to leave my baby in his car seat so he was enclosed and quiet when the dogs first investigated him. If you’re very unsure how your dog will react, you can also put the car seat up on a table so they can just smell the baby. You can pair that initial meeting with treats if you think it is appropriate. Try to find an opportunity (IF you think it’s safe) to let the dog see the baby and sniff him or her politely for a few seconds. Then tell your dog, “That’s enough,” and remove the baby. Give the dog a cookie if they leave the baby alone when you say, “That’s enough”. The first few times, you may need to physically move in between them to convince the dog to stop sniffing. Babies smell very interesting! Keep things very light and positive. If you’re not comfortable with your dog’s level of excitement, crate them and try again later or contact a positive-reinforcement-based trainer to work with your dog. It is important at some point to let the dog safely see and sniff your baby- curiosity is a powerful force, and it’s better for them to investigate the baby when you’re ready for them, not when they find an opening. Beyond planning for the actual birth, it is also important to consider how your dog’s needs will be met in those first few weeks. I love my dogs dearly and interact with them constantly. As a dog trainer, you would think I could stay on top of their needs even with a newborn, but I will tell you that we hired a dog walker during both of our sons’ newborn stages. There is just so much else to worry about – and if mom gave birth, she probably will not be up for walking the dogs in the first couple of weeks anyway. Rather than having an unexercised dog in the house, pay someone to make sure they get out at least once a day (or find a friend or relative who can do it). This will also help mitigate the guilt you might feel for ignoring your dog more than usual! Besides exercise, your dog will still need some attention. Try to keep some dry treats (my dogs like these) in your pocket and give them one every so often when they’re hanging out with you and being calm (especially when the baby’s around!). Prepare and freeze some Kongs ahead of the birth and/or try to make one per day for your dog to chew on and get some mental stimulation. When you feed them their breakfast and dinner, ask them for a sit/stay to keep some training up. You won’t have the time or energy your dog really needs, and that’s fine for a couple weeks, but try to be aware of them and give them some attention every day! Sometimes, having a dog at that moment in your life can seem like one more thing you don’t want to deal with, but it only lasts a short time and then the benefits of dog ownership and the love you have for your pet will quickly reassert themselves! Once you get through this rough patch, you’ll remember the excitement you felt about your child growing up with your dog in their life. The dogs in our household are integral members of the family. They enjoy a life of hanging out on the couch with us, sleeping in our bed, and lounging on the mats in the kitchen when we’re cooking. I encourage all of those behaviors because, for our family, they work! However, with the introduction of a new infant who needed to be laid down to be changed, laid down so I could swaddle him, and laid down on the floor to play, it became imperative that I could move the dogs quickly and easily. Our dogs are very responsive and relaxed with us in the house- so I could easily have just nudged them to get them to move, but there were two reasons I didn’t want to have to do that. The first is that when holding a newborn, you often do not have a hand free. The second is that I don’t really know if my dogs like being “nudged” out of place. It’s quite possible that even if they tolerate it, that form of touching actually bothers them. Given that, I didn’t want my dogs pairing the baby’s presence with something they might consider aversive. By training them to verbal cues, I could pair those cues with food and be sure they were moving because they were anticipating something good! That’s how I would like them to feel about the baby appearing, anyway! Here is my list of (nearly) essential cues to teach your dog prior to the arrival of your infant. “Move/Off” - There are many times per day when I find myself needing to put the baby on the bed, on the couch, on the floor, etc. … and there’s a dog there. It is extremely helpful to be able to tell your dog to “move” and have them do so right away. This is akin to “off” which is also a key cue at this point. When you’re having trouble getting the baby to latch on or take a bottle, you may just need your space and need the dog to move or get off the couch or bed entirely for a little while. “In/Bed/Place/Mat” - Have a place in each room where you’re likely to be playing with the baby that you can easily send your dog to and they will stay there. It makes your life so much easier! Plus, if your dog likes being on their bed or in their crate, this is not an “I’m ignoring you” command. The dog will be getting attention from you when you send them there, and then lots of praise (and ideally even a cookie every so often…) for staying there! “Come” - This is an important skill in any dog, but it’s particularly helpful to have a strong recall in the house. Getting out the door with a baby and their paraphernalia is a logistical challenge in the beginning. If you plan on walking your dogs with your baby, they should be able to come to you to get their leashes on without difficulty. Otherwise, you’ll be chasing them down or finding them in their beds, while also trying to soothe an infant in a stroller that hasn’t even started moving yet! A “come” cue is also important if you want to be able to leave the infant on the floor while you run to the bathroom, to answer the door, or grab a cup of water from the kitchen. It’s much easier to call the dog to come with you than pick up the baby and move them (and you definitely do not want to leave the dog and baby together unattended). “Leave it/Get it” - Once your baby starts eating real food, they will often drop it on the floor. Even before that, your baby will produce things from both ends that your dog will consider to be tasty. Being able to tell them to “leave it” will reduce your stress if you don’t want them constantly cleaning up after your baby. Conversely, if you really don’t want to have to pick up all of your toddler’s dropped food, having a really good “get it” is also helpful for after the meal! Make sure to train your “leave it” using treats, not through physically forcing your dog to leave it – again, you really do not want your dog associating your baby with aversive events. When training all of these cues, be sure to use lots of treats (and maybe even a clicker!) to make it clear to your dog when they are demonstrating desirable behaviors. When training behaviors that you plan to cue around your baby, it is particularly important for the dog to think that performing those behaviors will buy them something tasty, not worry that they might get punished. You never want your dog to associate your baby with punishment. To find out how to train these behaviors, go to a basic obedience class in your area, hire a trainer, or get a well-reviewed dog training book that teaches positive reinforcement-based techniques. Happy training! At some point, you’re probably going to want to leave the house with your baby and your dog. If you’re at all like me, you spent time during your pregnancy fantasizing about evening strolls with your new baby in the stroller and your dog heeling precisely at your side while old ladies stop you to coo over how perfect your newborn is… and at the same time, harboring the fear that you’ll be the one walking through the park with your newborn wailing to be fed and your dog leaping at the end of the leash and barking as the old ladies shy away from you. Well, this post is not about curing your dog of barking at old ladies, but it is about preparing your dog to exist politely with any kind of conveyance you plan on using for your baby- whether it is a car seat, a stroller, or some kind of baby-carrier. If your dog cannot remain calm and disinterested in the various types of baby transport, be sure to work with a trainer to help them learn. Most babies arrive home in a car seat and are frequently put into it and taken out of it as you go in and out of the house. The car seat itself rarely causes problems, since the baby is completely snuggled into it and often asleep. However, if you transport your dog in the car, it is worth considering your travel arrangements before the baby arrives. We own a Volkswagen Golf- it is definitely not a big car, but with careful planning we now transport two babies in car seats, three cats in their carriers (fastened to the center seatbelt), and two dogs tethered with harnesses in the trunk. For your car, you need to consider how you will restrain your dog. Even if you don’t think your dog will bother the baby in the car seat, they should not be loose, as they can become a very heavy projectile if you have to stop quickly. According to AAA, “An unrestrained 10-pound dog in a crash at only 30 mph will exert roughly 300 pounds of pressure, while an unrestrained 80-pound dog in a crash at only 30 mph will exert approximately 2,400 pounds of pressure. Imagine the devastation that can cause to your pet and anyone in its path.” (http://newsroom.aaa.com/2011/07/2011-kurgo-pet-surve/) So, take care of your pet and your baby by restraining your dog! With a seatbelt, your dog can still put their nose up to a cracked window, lie down comfortably, and won’t distract you. The options for transporting your dog in a car are generally a crate, a seat belt, or (if you have a hatchback or SUV) a pet barrier between the trunk and the backseat. If you plan on using a pet harness, you have to be comfortable with your dog being in the backseat within reach of your baby. If you don’t fully trust them, plan on using a crate or barrier. Whatever you decide to go with, start traveling with your pet restrained using that system well before the baby is born. That way, if they bark or whine to be let loose, you can work through it before you have a sleeping baby in the car! Many dogs that heel very nicely on-leash get confused once a stroller is added to your walk. Be sure to get the stroller out ahead of time and see if your dog needs some extra heel training when walking with a stroller. If not- great! If they do, it’s better to work on retraining the skill before your baby is actually in the stroller. Never attach any dog’s leash to the stroller, as they can bolt suddenly when you least expect it. If your dog has had trouble with wheels in the past (for example, barking at skateboards, bikes, rollerblades, or trash bins), make sure you start early and with the stroller at a comfortable distance from the dog. This would be a good situation to contact a trainer to work with you, as this can be a very difficult behavior to get past. Lastly, with any dog, take them for a walk around the block with a “screaming baby” track playing from your phone or iPod in the stroller. Make sure your dog can remain calm and not obsess over trying to look into the stroller. I found that the easiest way to walk my dogs with my baby was by wearing my baby in a carrier. My first son preferred the Sleepy Wrap initially, but my second son prefers the Ergo. I like both of these options better than the Baby Bjorn, as they keep the newborn totally enclosed (no dangling limbs), and their faces tucked in by your chest. Especially if you plan to take your baby to dog parks, where strange dogs might come sniffing and jumping on you, please consider using a carrier that does not have your baby staring straight out and exposed. Whatever system you choose to use, put it on in the house and stick your “practice” baby (doll) into it. See how your dog reacts. Some initial curiosity is fine, but they should not be jumping up on the carrier to see what’s inside. If they don’t settle down and lose interest, do some training with sits and heeling while wearing the carrier. However you choose to arrange your baby and dog, you should all be comfortable with it. Walking your dog should be relaxing, rewarding, and a good way to get out of the house for some exercise with your baby. Some of my favorite moments of the week are when my husband and I get out with both our sons and both our dogs for an evening walk. I hope it’s that way for you, too! The last part I'm going to talk about in terms of the physical environment is introducing your dog to the new sights and obstacles that will become part of your home. One of the biggest physical changes in most households is the introduction of baby furniture. Sometimes this will be mostly confined to one bedroom, but oftentimes, especially in small city apartments, there are changes throughout the home. In our apartment (~950 sq. ft.), furniture was rearranged everywhere to accommodate our first son when he was born. Besides the “office” being converted to a baby room, we added a Pack ‘n’ Play to the living room, a swing near the dinner table, and, eventually, a playpen in the middle of the apartment. If all of these changes had happened at once, I think Beskow (our more anxious dog) would have had a heart attack! Pack ‘n’ Play – Special Note: We had a Pack ‘n’ Play in our living room so we had somewhere safe to put the baby down if we had to leave the room, even for a moment. Remember- NEVER, ever leave the baby on the floor with the dog in the room. For us, the Pack ‘n’ Play was an easy solution to provide a safe play space for our newborn. Barriers Also before the baby is born, you should get your dog acclimated to being blocked from certain parts of the house. We set up baby gates between the kitchen and the rest of the house, and at the entrance to our baby’s room. This way we could be in either of those places, with the baby on the floor, without the dogs being underfoot. Our dogs were not used to being closed out of places where we were working or hanging out, so it was good to get them used to the experience before it could be paired (in their minds) with the baby getting attention. Weeks before the baby arrived, they got over whining and pawing at the gates and just found somewhere else to lie down. Our dogs were also not used to being crated when we were at home and awake. They were used to being crated when we were not home and occasionally at night, but not when we were home during the day. They really like their crates and will hang out in them when the doors are open, but being crated when we were home watching TV or entertaining visitors was NOT something they were used to doing. So, we had to practice before the baby arrived. I highly recommend it, because that way you won’t have to deal with them whining or barking at you for attention once you are also dealing with an infant. (If your dog isn’t already crate trained, a trainer can help if you’re not sure how to go about it.) If your dog likes their crate, they’re likely to get over this relatively quickly. This was also our go-to solution when we brought in a babysitter. Until we had a regular babysitter who knew our baby, our dogs, and our rules about the dogs around the baby very well, we always crated the dogs if we weren’t there to monitor them. Continuing with environmental changes... When preparing your dog for new smells, it can be useful to get a relatively life-sized baby doll that you can “put” the smells on and carry around like a baby, up high out of reach. This baby doll can also be used to get your dog used to how you will transport your baby. T o us, baby diapers stink. To a dog, well, I can only assume they fall into the same category as cat poo, dog poo, and dead mice… i.e., “Ooh, hurray! Delicious!”... Silly pups. Anyway, it is worth making sure that your dog is not too interested in diapers before you’re carrying around a baby in a dirty diaper. Although it sounds disgusting, try to recreate a “wet diaper” before the baby is born. Put a tiny dab of your pee on a diaper or get a diaper from a friend with a baby and rub the wet side against a clean diaper to put a little smell on it. (A truly wet diaper is a little too gross to keep around.) Put this diaper on a doll and let your dog take a sniff. If they don’t care- great! If they do, let them have a short sniff, then say, “That’s enough,” and move away. Reinforce them with a cookie for being polite. If they keep bothering you and jumping up to sniff, you need to do more work. Get a Diaper Genie (or something similar) to contain the diapers. If your dog gets ahold of a poopy diaper once, they’re likely to try again. If you block this behavior from ever occurring you won’t have to worry about it. You can’t really prepare for the smell of breast milk, but if you plan on using formula, make a little up ahead of time and drip that on the baby doll’s clothes, too. If you are formula feeding, your baby will almost always smell like that. Practice polite behavior around the smell, just like with the diaper exercise above. Lastly, whatever lotions or powders you will be using, you can either add them to the baby doll, or just smear a little on some towels, the changing table, or in the crib so those places start to smell like “baby.” It’s one less change for your dog to adjust to once the baby arrives! Preparing Your Home’s Physical Environment for the Introduction of Baby Part 1 of 3 - This is going to be a three-part series posted over three days. Stay tuned! It is a huge change in your dog’s life and environment when your brand new little baby comes through the door. There is a sudden barrage of new sounds, smells, and movements. Pair that with a drop in the amount of attention your pup will receive from you and it can be an extremely confusing time for your dog. There really is no way to avoid those changes happening suddenly and unexpectedly, but you can make it easier on your dog by preparing your home as much as possible in advance. Our two dogs are very different. One of them needed a lot of work on these environmental changes, while we could skip many of these preparations for the other. Work with your dog and a trainer to figure out what you need to do for your family. These are just general "good ideas". When I think about the environment in terms of how your dog interacts with it, I break it down into sensory categories rather than rooms. Regardless of where you decide to put the baby’s furniture, try to make sure you prepare your dog for the new sounds, smells, and sights in their environment. A baby’s cry can be anything from a grumble to an ear-splitting wail. It can hurt our ears to listen to it, and we know it means we need to pay attention to our baby and fix what’s wrong. To a dog (I assume), it’s a very loud, uncomfortable, meaningless noise. Some dogs couldn’t care less about loud sounds, but some are extremely sensitive. Before you bring your baby home, look up a video of a crying newborn on YouTube and play it for your dog. Be sure to start at low volumes, pair it with treats, and increase the volume gradually. You want to get your dog used to the sound, not scare them! As a mom, I can tell you that we LOVE our baby swing. Our baby naps very well in it, so it runs a lot throughout the day (and sometimes into the night). The swing makes clicking and swishing noises as it rocks back and forth. It also has the option to play music or white noise. My dogs never cared about those sounds, but it is possible that your dog will. To find out, run the swing a few times before the baby is born and make sure your dog doesn’t mind the noise. Just like with the baby cries, be sure to build up to the full experience. Start with your dog in the next room and either let them move closer or move them closer gradually with treats if they don’t seem to mind the sounds. Whether it’s the noises on the swing, the Sleep Sheep in the crib, or (in desperation) the iPhone in the stroller, people play lots of white noise and music to their babies. Make sure your dog isn’t bothered by these sounds, just like with the noises above. How Do I Make My House Safe For My Baby And My Dog? This is the start of a new series on preparing your dog for your baby’s arrival. There are lots of good sites out there that deal with this topic, and I highly encourage you to look at them! In this blog, my plan is to share my personal experiences in preparing for our first baby – what worked well, what I wish I had done differently in hindsight, and why I think these steps are important. Everything I write is based on information I’ve collected as a behaviorist and dog trainer, combined with what has worked anecdotally in my own house. Does every dog need lots of preparation for the arrival of an infant? Probably not. There are probably super mellow, old dogs that are truly unflappable and couldn’t care less about the huge change in their environment. I would hazard to guess, however, that nearly every dog needs some sort of preparation, and most dogs need a fair amount of groundwork to make sure they are truly comfortable and relaxed once there’s a new baby in the house. So… the topic of the day is Safety! I chose to cover this topic first, because it is clearly the most vital. Eventually, you will have to worry about keeping your dog safe from your baby, but your initial concern is naturally keeping your infant safe from your dog. Almost all family pets are lovable, tolerant, wonderful members of our families – I don’t doubt that your dog is amazing! – BUT all dogs are dogs. All dogs are animals. And all animals can bite if they get scared or confused. The good news is, bites can be avoided with some careful planning and precautions! Never, ever, ever leave your baby on the floor where your dog can reach them, unless you are actively paying attention to your baby. NEVER. We’ve all heard the tragic stories in the news, and it just is not worth the moment of inattention to check your email, run down to change the laundry, or step into the other room to get the phone. If you are not actively paying attention to your baby, they should never be within reach of your dog. And no, I don’t just mean this if your dog is a “scary breed” or big dog, I mean this for all of the little, fluffy dogs, too. In fact, a 2008 study found that “Breeds with the greatest percentage of dogs exhibiting serious aggression (bites or bite attempts) toward humans included Dachshunds, Chihuahuas and Jack Russell Terriers (toward strangers and owners); Australian Cattle Dogs (toward strangers); and American Cocker Spaniels and Beagles (toward owners)” (Duffy, D.L., Hsu, Y. and Serpell, J.A. : Breed differences in canine aggression Applied Animal Behavior Science 114: 441-460, 2008). I’m not saying this to malign any breed, just to emphasize that all dogs are capable of biting and that regardless of their breed you have to be careful! In our house, our infant spends a lot of time in his Pack ‘N Play. He’s not old enough to need more room than that, and that way he is safe and, as an added benefit, his toys are also not all over the floor. When you stand up, take your baby with you. Put them in a carrier, a car seat, a stroller, or a swing for the few minutes you need. Just make sure they are securely contained and up off the floor.